We’ve made some enhancements to the MPS West Studio including the addition of a green screen wall and an available iPad based Teleprompter. We’ll be installing some lights over the next few weeks but am really shocked at how good the green screen worked using the office lights in the studio. The above sample was just using the stock chroma filter in Final Cut Pro X with no changes. 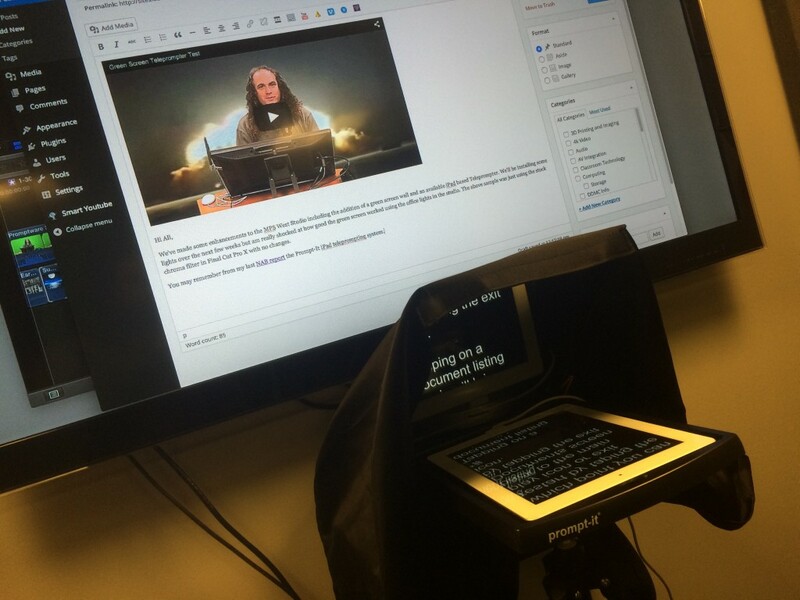 You may remember from my last NAB report the Prompt-It iPad teleprompting system. We now have one available for the space. It works great but file management on the iPad is a bit of a pain. We’re working on some creative ways around that so stay tuned. We’re also going to be experimenting with some enhanced lighting in the room so there will be updates on that in the future. Mich Donovan who recently joined my team to work on Duke’s Online Courses initiative is now working in the MPS West Lab in a newly created editing/collaboration suite (in place of the old 3D studio which is in the process of being relocated on campus). He’s available to assist you in getting started in the MPS Studio so email oit-mt-info@duke.edu to set up an appointment. The MPS West Studio is bookable in Outlook and is available 24×7 however some equipment like the Teleprompter will only be available during regular business hours unless you make previous arrangements. This entry was posted in DDMC Info. Bookmark the permalink. This entry was posted on Friday, February 13th, 2015 at 12:23 pm	and is filed under DDMC Info. You can follow any responses to this entry through the RSS 2.0 feed. You can leave a response, or trackback from your own site. DDMC is powered by WordPress at Duke WordPress Sites. Please read the Duke Wordpress Policies. Contact the Duke WordPress team.